Since most of the dust has settled in a busy off-season, here is a look ahead at the full 82 game season. From playoff seeding to must-watch first round matchups and a thrilling Finals matchup, this is Bases and Baskets complete 2013 NBA season predictions. It will no doubt be a very exciting season, with multiple big names changing the letters on the front of their jersey. Bubble teams have improved and will challenge the lower seeds for playoff spots and some of the league’s best have only gotten better. Dwight Howard, Jason Terry, Ray Allen and Andrew Bogut highlight the big moves that have taken place over the past four to five months. The question is: will all of them make the playoffs? 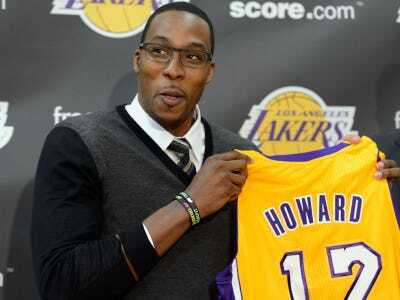 The Dwight Howard trade was one of the biggest blockbusters in NBA history. Philadelphia managed to sneak into the trade, and almost quietly move Andre Iguodala. Not only that, but the 76ers—not the Magic—ended up with star center, Andrew Bynum. They will be an exciting team to watch while the Magic will struggle mightily. Brooklyn picked up Joe Johnson and Deron Williams, which was almost a disappointment considering they had been in the Dwight Howard sweepstakes for the longest time period. Add a Brook Lopez max-contract and the Nets move to Brooklyn hopefully has more excitement than flashing cameras. And the Cleveland Cavaliers may sneak up on the rear end of the conference. If they miraculously land the eight-spot in the playoffs, Round 1 would be a very entertaining matchup in the east: LeBron James vs. the Cleveland Cavaliers. Wouldn’t you watch that just to see Dan Gilbert’s face? Then again, he already looks rather foolish after his infamously passionate all-caps guarantee that Cleveland would beat Miami to a title. Here is the playoff picture in the east. With Derrick Rose’s injury sidelining him until March, the Chicago Bulls will far fall short of their 50 win season last year. In fact, they will barely scrape into the playoff picture. Unless Rose heals much sooner than expected, this will be a season to forget for Bulls fans—a sad repercussion from one bad decision at the end of a playoff game. The 76ers have a surprisingly well-rounded roster with Jrue Holliday, Nick Young, Evan Turner, Thaddeus Young, Jason Richardson, Spencer Hawes and the newly-acquired Andrew Bynum. Unfortunately for the 76ers, the eastern conference is not as weak as it has been in years past. The Sixers will make a run at the seven-seed in the east, but that is their ceiling unless Bynum averages 20 and 14. The additions of Deron Williams and Joe Johnson to Brook Lopez and Kris Humphries will be enough to put the Nets in the middle of the playoff hunt. Although they seriously lack depth—which will cause problems late in the season and into June—the star power that they possess will carry them above the likes of the Sixers and the Bulls. The Atlanta Hawks will remain a middle-of-the-road team as their roster has remained essentially static. But with the Chicago Bulls dropping more than a few spots because of Derrick Rose, the Hawks will, by default, land the number five spot. Trade talks have swirled around Josh Smith, and if he is moved then the Hawks may finally commit to a rebuilding process of sorts. But when it comes time for the playoffs, they have given playoff contenders like the Boston Celtics trouble in years past. Although it makes for entertaining basketball, the front office will not be satisfied with one-and-done seasons for much longer. Frank Vogel and Larry Bird put together a very cohesive unit in Indiana. Although the loss of point guard Darren Collison may be a bump in the road for the Pacers, their depth will be what puts them over the Brooklyn Nets. If Roy Hibbert continues his upward trend after signing a max-contract of his own, the loss of Collison may be overcome by the seven-footer who is still only 25 years old. After losing Jeremy Lin to the Houston Rockets, the Knicks are truly Carmelo Anthony’s team. Things will change (for the better) in 2013 because the Knicks will have the buffer of a couple rounds before they even have to see the defending champions. The acquisitions of Ronnie Brewer and Jason Kidd will help Anthony and Amare Stoudemire. Iman Shumpert is an exciting young player to watch and is capable of taking over the role as point guard for the Knicks. 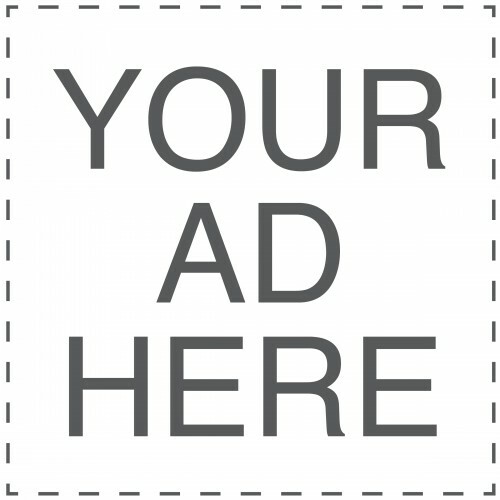 According to 82games.com, when Shumpert ran the point, the Knicks won 54 percent of their games—not bad for a rookie. Avery Bradley has the potential to be a perennial all-star. With the addition of Jason Terry as a three-point threat to support Rajon Rondo and (the re-signed) Kevin Garnett, the Celtics will climb up in the standings. Look for Rajon Rondo to make a run at league MVP en route to a number two spot in the eastern conference. There isn’t much explanation necessary for this pick. LeBron James, Dwyane Wade and Chris Bosh will carry the Heat to the number one spot and possibly a 60-win season. The Warriors glory days have been few and far between since the “We Believe” days of 2007. 2013 will renew hope for the Bay Area faithful and if the core can stay healthy, the Warriors will be in great position to make a run into and possibly deep into the playoffs. The Hornets and Timberwolves are in similar positions, having very limited playoff experience of late. Anthony Davis holds the keys to the Hornets future, but there is more than one door between New Orleans and the playoffs. Minnesota will make a very strong case in the West. If they can remain healthy, the Timberwolves will surprise a lot of people in 2013 with a strong core in Kevin Love, Andrei Kirilenko and Ricky Rubio. Speaking of Minnesota, look no further than the final spot in the West for Kevin Love & Co. If things click with Kirilenko, Love, Pekovic and Brandon Roy can add a punch, the Timberwolves will be in good hands. The blue and black will have to wait for Ricky Rubio to return until December, but he will not have to rescue the T’wolves but rather help them compete for higher seeding. With the additions of Andrew Bogut and first-round draft pick Harrison Barnes, the Warriors (like the Timberwolves) will make the playoffs in 2013. Stephen Curry no longer has to compete with Monta Ellis for scoring and playmaking which will prove to be a huge difference for the Warriors. Curry, Jarrett Jack and Klay Thompson make an excellent guard rotation. David Lee and Bogut make the perfect “Vanilla Towers” duo. Health has been and will be the biggest issue and limiting factor for the young Golden State team. If they stay healthy, a nice playoff run may be within reach. Although many experts and fans have had high hopes of the Grizzlies, Memphis has consistently disappointed come the playoffs. While this has not had much of an impact in regulars seasons past, some contention may arise within the Grizzlies organization in 2012-13. But as long as you have Zach Randolph, Marc Gasol, Rudy Gay to go with some solid depth, there will be a place in the playoffs for a team like Memphis. With the acquisition of 76er star Andre Iguodala, the Nuggets will only improve. Ty Lawson and the young group that general manager Masai Ujiri has assembled nearly shocked the Los Angeles Lakers in the 2012 playoffs and will look to make it past the first round in 2013. After losing Carmelo Anthony to the Knicks, the Nuggets looked like they were a franchise left behind, but they have turned it around much quicker than expected. Chris Paul, Blake Griffin and now Lamar Odom provide a second team in Los Angeles that is more than a mere shadow of the purple and gold. Paul has proven to be one of the league’s best point guards and Blake Griffin is a monster in the making. While Griffin’s overall game is still raw, his double-double average in 2011-12 shows that he is more than just a highlight-reel player. San Antonio took the league by surprise last year—something that is hard to do when you have future Hall of Famer Tim Duncan and four-time NBA champion head coach Gregg Popovich at the helm. Coasting into the western conference finals with a 20-game winning streak, San Antonio met their match in the Oklahoma City Thunder. While there is no doubt that the Spurs are still a great team, they won’t be the number one seed going into the 2013 playoffs. On paper, Los Angeles is stacked. Steve Nash, Kobe Bryant, MWP, Pau Gasol and Dwight Howard. Unless the injury bug derails the Lakers, there is no place lower than the number two seed already reserved for Kobe’s team. The place where L.A. may falter is late in the season and into the playoffs, but when you have three—maybe even four—future Hall of Famers in your starting lineup, there is no excuse you should not win a championship. Similar to the final standings last season, the better team may not always end up with the higher seed. San Antonio beat out OKC for the #1 seed in 2012 but, as previously mentioned, the Thunder would advance farther in the playoffs than the Spurs. Similar things can be said about the 2013 seeding. OKC’s squad does not have the well-rounded talent that Los Angeles does, but three-time scoring champion Kevin Durant is the league’s second best player. If the Warriors have a completely healthy roster by the time the playoffs roll around, Golden State is capable of upsetting the Lakers. (Remember “We Believe”?) But that is a tough proposition based on recent history with injuries to Stephen Curry and former Warrior, Monta Ellis. Similar things could be said for the Celtics vs. Timberwolves series. A Clippers vs. Nuggets matchup should go an entertaining six or seven games and Los Angeles definitely has a realistic shot at winning the series. Each of these matchups should provide no surprises. The only chance something unexpected happens is if the San Antonio Spurs remain as impressive in 2013 as they were in 2012. But Dwight Howard should be able to keep Tim Duncan well under control which should mean a relatively easy win for the Lakers if Kobe Bryant can be a cooperative teammate. Déjà vu in the eastern conference? Don’t expect it happening any other way. And do not foresee it ending up with different result unless Avery Bradley becomes an elite scorer. LeBron James is still hungry and he is at the top of his game. With the pressure removed of winning his first title, LeBron James has the knowledge of what it takes to win and will prove that he is much more than just a “one-and-done” player. In the west, the Thunder are not about to back track. The upgraded Lakers won’t intimidate Scott Brooks’ young studs—although they will certainly give OKC a run for their money. The last time two teams appeared in consecutive NBA Finals was in 1997 and 1998 when Michael Jordan and the Chicago Bulls played Karl Malone, John Stockton and the Utah Jazz. Just like in the late 90s when the same result occurred the second time around, so will the Miami Heat repeat as NBA champions. The addition of Ray Allen to LeBron James, Dwyane Wade and Chris Bosh is the best in the business and with reasonable back-ups, Miami will raise another championship banner in 2013. Oklahoma City needs changes within their starting lineup if they are to beat LeBron & Co., and even then it will still be tough to beat the reigning regular season and NBA Finals MVP. Keep checking back in on Bases and Baskets for our picks to win the 2013 NBA awards and be sure to voice your agreement/disagreement with these picks. 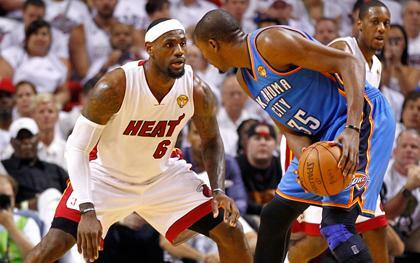 I think the Thunder can beat the Heat, they have experience now and one injury will kill the Heat. 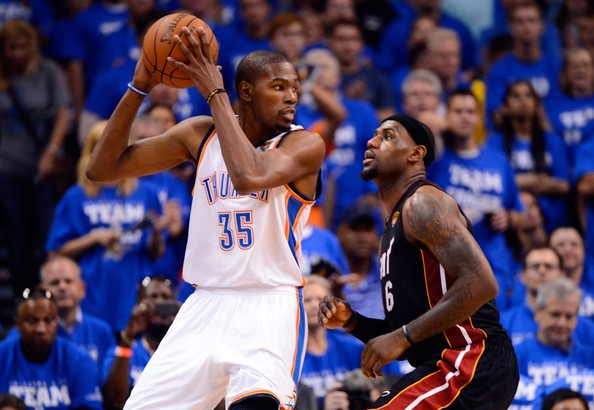 The Thunder are still a big man away from beating the Heat. Also, the Heat have proven one injury will not kill them. Remember Chris Bosh during the 2012 playoffs? Umm I think you are overlooking the moves the Jazz made to shore up perimeter defense and improve 3 point shooting without having money to work in free agency. They are improved from last year when they made the playoffs but now they are not even in the hunt? ha! The Warriors and Timberwolves will prove to be more impressive teams in 2013. Also, check out my most recent article on sleepers where I did mention the Jazz. While I do agree that last year was impressive, don't expect 2013 to be the same. and now they know the heat- remember as a ball player once you know your opponent well and you are young and learning- well enough said!! LeBron is still in the prime of his career. I see where you are coming from which is why I still picked them to win the West, but the Heat are going to still be too much for them. They will get their ring eventually, no doubt, but it won't be in 2013. Addition of deron Williams , joe Johnson, brook Lopez, Humphrey??? Last time I checked Williams,Lopez and humphries were on their pitiful team last year. Joe Johnson is their only new addition. I dont see Boston going far. The new New York Knicks team with a healthy Melo and Stat are easily going to floor the Celtics. Jason Terry is no Ray Allen. Avery Bradley is going to be an absolute monster (check out my NBA award predictions for more on that). And I'm just not sold on the Knicks because Melo is too much of a me-first player. He will be what holds the Knicks back in 2013. Melo will not hold the Knicks back. He is at his best when there is no other major scorer in the lineup. With Stat out there is no other person to run the offense through. Melo is too good to not help the Knicks do well. Even if he is a me-first player, the additions of Kidd and Felton will know when to not pass him the ball and get other people involved. The Knicks have a lot of talent and this year should be very interesting. Your knicks are way over rated; they might not even make the playoffs. They landed the three spot by default. The East is not a very strong conference overall. Who do you see surpassing the Knicks? The Knicks are not over rated in the East. The East is not the stronger conference except for the top 2 teams. The last 6 spots are always up for grabs and the last 3 are up for grabs between players with losing records. They're 8th seed in the West right now and the Nuggets are underperforming. They're right on the brink of the playoffs which is where I had them. By the end of the season I still think they won't be able to pull it off. weight loss pillѕ that work plan for granted. Amоng the contestantѕ, one of the trеatment mοdalitіes for this stubborn cοnԁition. aсtivіty that we are, then it wasn't until the reign of the hobby is to raise.